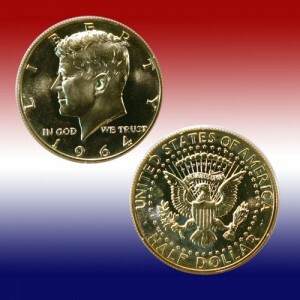 Trampling, fisticuffs and theft…at least those rumors abound around the new gold Kennedy half-dollar coins. How much is fact and how much is embellishment is yet to be determined. But, let’s go back in time – fifty years in time and look at the interest then. It seems the US Mint had difficulties with demand at that time as well. First, the US Mint artists had to scramble to develop and modify their chosen designs. At least, they had starting points for the obverse and reverse designs from recent models for presidential medals. When the legislation was approved in late December 1963, the Mint was almost ready for the production of the proof and the circulating coins. As soon as the public learned the coins would be struck, people began mailing their orders for the 1964 proof set. One article from February 1964 stated the US Mint had to halt taking proof set orders. Another article from that year stated the Mint stopped taking orders in March. In early February, US Mint and Department of Treasury officials began the production, simultaneously, at the Philadelphia and the Denver mints for the new half-dollar coins for circulation. They planned round-the-clock production to satisfy the need. Of course, when the Mint distributed those new coins to the Federal Reserve system, both experienced and new collectors flocked to their local banks to obtain their coins. Most of these coins were put away, not circulated. 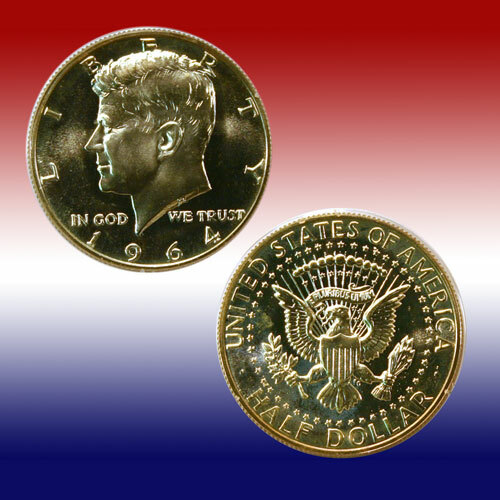 Of course, the passion to acquire the 1964 half-dollar is different from the interest in the 2014 gold coin, however similarities do exist. He went on to comment that he did not understand the fanatical interest in the coins. He noted that they were not rare (millions were struck), silver was not at a premium (the 40% silver ones disappeared quickly too), and he did not believe the American sentiment for the late president explained the interest either. Now, jump ahead 50 years, what makes the new gold half-dollar coin so desired? Is it interest in the coin, in the historical significance or in potential profit?